If you happened to catch our first interview with the good folks from Telltale Games, you'll likely remember that we had the opportunity to do two separate interviews with two different groups of folks from the development company that's leading the revitalization of adventure gaming. In our second interview, we sat down with Mark Darin, Designer/Programmer at Telltale Games and the director for Tales of Monkey Island Episode 2: The Siege of Spinner Cay, to talk about what influenced the making of the Tales of Monkey Island series, as well as how you can find co-op in the least likely of places. Co-Optimus: When the Telltale Games crew sat down and took a look at the Monkey Island series, what served as a starting point for the Tales of Monkey Island games? Mark Darin: I think when we first heard that we had the opportunity to make a Monkey Island game, we evaluated where fans resonated most with the series, which games they liked... What we found was that Monkey Island 2 and Monkey Island 3: Curse of Monkey Island were the two games that people really seemed to resonate with. So we had two very different Guybrushs to deal with, and he’s been changing a lot over the years, but at least for our artistic design we decided we wanted to mesh 2 and 3, pull our artistic influences from there, and then give it our own kind of spin. Co-Optimus: Did these games also influence the story elements? Mark: From the story standpoint, we found that the later Monkey Island games started to drift away from that "pirate world." Monkey Island 4 had that big tourist trap kind of feel and there really wasn’t much "piratey" stuff going on, which was a big part of the atmosphere and draw of the original Monkey Islands. So it was important for us to pull [the series] back to its roots. [We wanted to] make sure the pirates are pirates and that there’s sword fighting, swashbuckling and ship battles; you know, the things you associate with pirates. Even though Monkey Island is definitely known for its humor, which is key, the other thing that defines Monkey Island is that the underlying storyline is usually very serious. A little bit dark, not overly dramatic of course, but it’s got a serious tone under it so that was another thing in the design for the story that we wanted to keep... Those were the key elements for our design thought processes in the beginning. Co-Optimus: As you were developing Tales, were there specific elements from past Monkey Island games that you recognized as being key to include? Mark: Those are usually aesthetic touches, like Guybrush’s blue coat. 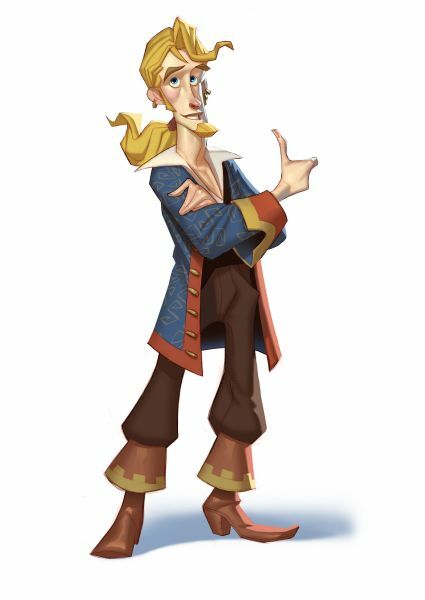 If you go through and start looking at fan art for Monkey Island, he’s always got that blue coat from Monkey Island 2… even when they’re drawing him in the Curse of Monkey Island style. So we said “alright, we gotta get that blue coat back on him.” And then just characters in general, like the Voodoo Lady and LeChuck. LeChuck was interesting because we didn’t really know what to do with him at first. He’s gone through so many iterations over the years and I think the last time we saw him he was a giant stone statue that blew up. So early on we were trying to figure out “what are we going to do with LeChuck” and we had a whole bunch of different concept art. The one that we almost ended up going with he had these gigantic tusks and horns coming out of his head and we said “we want to get him to the next level” but he just looked like a walrus (laughs). So we kind of pulled back, went more “classic” LeChuck, and built up from there. Co-Optimus: Aside from the classic adventure games of the ‘90s, have there been other games that have influenced you all? Mark: There are a lot of interesting games that are out that we’re looking at, which includes independent games as well. Something that we had our eye on as an influence at one point was an independent project called Façade… Basically, it’s a conversation simulator. You’re invited in to a couples’ home and they’re arguing. It presents [you with] on the fly situations that change fluidly so that your actions are going to influence whatever these other characters are doing. And that’s the kind of stuff we take a good look at; how can characters interact fluidly with one another. Storytelling and characters are key to what Telltale is building on so those are the kinds of games that we’re interested in looking at. Co-Optimus: What’s been your favorite moment, so far, in terms of getting back into the world of Monkey Island? 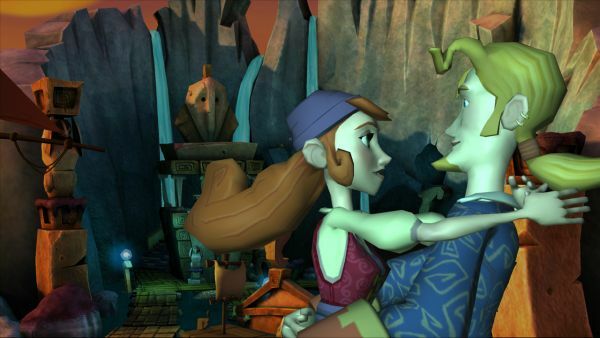 Co-Optimus: While the Monkey Island games are built from a single person experience, do you think there is some kind of co-op experience to them? Mark: I actually think about this a lot when I’m designing the games. Even though it is a single player experience, adventure games, maybe because they’re a bit slower paced and there’s a lot of thinking and puzzle solving involved, play out almost exactly like a television show when you’re watching them. So it is a kind of experience where you can actually sit down with a group of people and play. Even though one person’s controlling it, everybody else is thinking the same way you’re thinking and shouting “oh oh, go try this” or “combine this with that!” I think some of my favorite experiences with the Monkey Island games were when I did get together with my friends and we’re just kind of sitting around yelling at each other to “go try this” or “go do that”… It’s really nice to play with a group of people, [when it comes] to adventure games, as often times it leads to an enriched experience for everybody. Collectively, you’re helping to move the plot along and everybody feels involved, even if it is only one person with the controller. We wanted to thank Mark, Dave, Dominic, and Chris again for their time and talking with us in-depth about Telltale, Tales of Monkey Island, and more during PAX. The first two episodes of Tales of Monkey Island are available now from the Telltale Games website, while the third episode is slated for release later this month. As Dave, Mark, and Dominic all indicated during the interviews, you can find often find a co-operative play experience in a game that is otherwise a single player game. Our own Mike "pheriannath" Katsufrakis has been pondering this phenomena and has been working on a little something that explores this "creative co-op" experience in more detail. Be sure to keep your eyes peeled for that and more over the next week at Co-Optimus!